As the last days of the old year fall away, I’m still feeling the festive spirit, especially when I come across an unexpected twinkle-lit window, move among the many shoppers still crossing things off their lists or glance at the glow of the moon nestled against the starry sky. It bubbles up with each holiday card that finds its way pinned to the verdigris garden lattice in our plant corner, knowing that the kitchen cupboards are bursting with winter teas, luscious chocolate, and savoury crackers – these are the days of yuletide revels where dark red wine, nostalgically spiced almond nog and icewine flow, creating warm worlds between the hours. The very air is filled with magic, tendrils of wood smoke and lit candles nudging people home to put the kettle on, light a candle of their own or curl up to read a good book. This holiday season I received a lovely hand-painted pine wine box from my Mom that sits beneath my bedroom vanity, holding winter books waiting to be opened. I purchased one of the books from my father’s beloved bookstore early in December when I dropped off a holiday card for his favourite bookseller. We used to take a taxi up to West Broadway to wander the stacks, choosing books together while taking in all the colour clamouring for our attention. There were tears and hugs that day but it was a pilgrimage worth taking amid all the hustle and bustle, I’m looking forward to a mid-winter visit to add another new read to the box! Closer to home, there’s an old wood house painted dark green where a bright pink rhododendron bush blooms no matter the season – I often walk by, drawn to another warm world between hours. Behind the large picture window is beautiful soft lighting, healthy green plants and a few much-loved objects lying just so on the many surfaces surrounding what looks like, a very comfortable couch. There is usually someone reading there, with knees up and dark head bent over unknown pages, revealing even more tantalizing worlds. Worlds captured underneath the stone bridge near Beaver Lake in Stanley Park (Vancouver, B.C.). 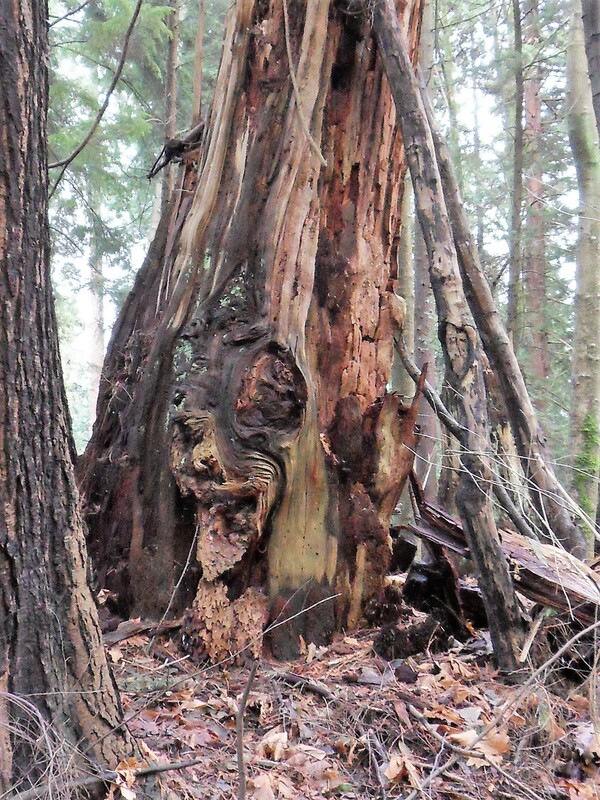 This wolf’s-head capture reminds me of Game of Thrones or Lord of the Rings…we stumbled upon this magnificent tree on that same hidden trail in Stanley Park (Vancouver, B.C.). This entry was posted in blog, journaling, life, memoir, photography, travel and tagged books, grief, hours, January, journey, love, magic, revelations, revels, scent, tea, time, winter, worlds, Yuletide. Bookmark the permalink. Thank you, Diana…your words have painted a lovely picture, too…I’m so blessed to have them here! I found myself walking past that cozy house again yesterday afternoon and smiled when I saw all the familiar elements that caught my imagination…I could feel the possibility of spring on my way home from the coffee bar, it was lighter later and there was a lovely crescent moon winking in the twilight! I’m glad you loved the post, Mom…I love your words, they conjure up so many beautiful things to ponder. Hi Shirly…i just wanna say (though a bit late; i was away for a long while)…happy new year …and i adore your gift to Kim. I can almost picture it out myself. Hi, Mich! That beautiful box also holds articles torn from newspapers, etc., and borrowed magazines from our local library! Thanks for your kind words. I am a person who seems to be so aware of scents, even at my age, and I remember the spearmint around the lake in the mountains by Montreal. I remember when we moved to Vancouver Island, the smell of the wood on the passing logging trucks, even though now I am a tree hugger, I can bring most of my favourite scents to the fore. Lucky to have a daughter who can also bring words to action. Take care and thanks for your kindness. Hi Kim! Great post! Reminds me of my time in the pacific NW. There was a great bookstore I used to go to. What a nice memory of those times with your dad. ~Kim. The Pacific Northwest is a wonderfully, wild place to live…on any given day, just outside my windows, I can see eagles and ravens wheeling by and to still have real bookstores to explore is even better! Thank you so much for stopping by, Kim, it warms my heart. I’m always happy to see another traveler stop by, thank you for the lovely words! you write so well, feel like I’ve had a visit thanks for the nog … and loves these shots, magical! 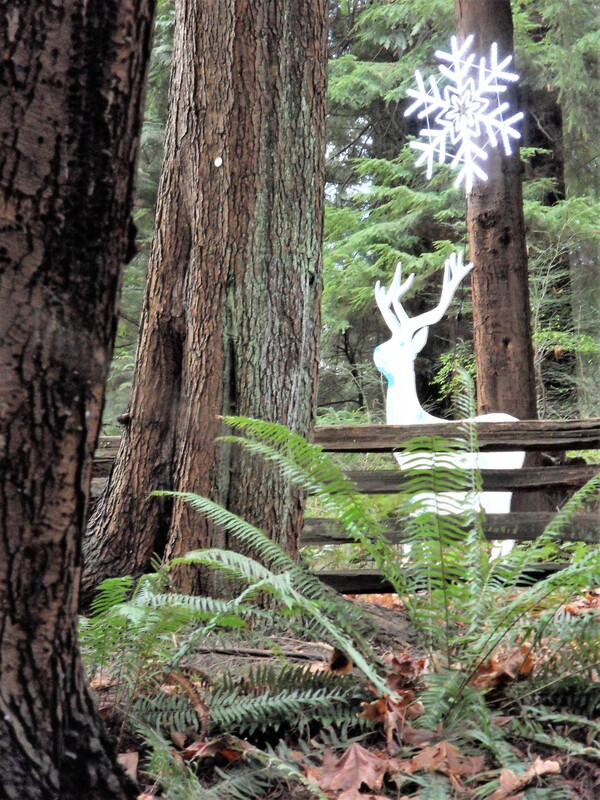 We’re so lucky to have magic to wonder at on our doorstep…I’m glad you enjoyed the nog, your lovely comment brightened an already sunny morning! Hi, Theresa! I’m so glad you stopped by…going forward, I just wrote a poem yesterday in a quiet coffee bar and will post it soon…I hope to attend more yoga classes down by the harbour…writing wise, there is so much I’d like to tackle, our city is filled with inspiration! What a warm and lovely post on a cold snowy day, Kim. Hugs on the wing. Hi, Teagan! Thank you for stopping by & leaving such a lovely comment…I love how the blogging world intersects, Andrea’s writing is magical, I’m so glad I stumbled upon her beautiful blog! Hi! I like your post:) Maybe you remember me from my previous blog “this life of us”, just wanted to let you know that I am back with a new site! Posting will start soon. I’m looking forward to reading more of your beautiful writing…thank you for remembering me and stopping by for a read! HP scene aside, I love the way you write. This entire post read like a daydream and you do such a fantastic job painting the different scenes and taking us through them all. I knew you’d like it! Thank you for leaving such exquisite words, they’ve warmed my heart, Jade! I did like it! Thank you for thinking of me, Kim! Reading your writing is such a treat for me, Kimberlee! Your style is what I aspire to- it’s just beautiful, deep, intricate, and lovely. Also- I love the “Harry Potter” scene- so accurate! Patronus! Have a wonderful week ahead! My heart is full…I’m so blessed to have such lovely words on my page, Mackenzie…it warms my heart! I just can’t help but say this…how lucky you are to have such magical nature just around your corner..your photos speak a lot of those magic Kim…i haven’t seen something like that here..
We’re so lucky to find magic just minutes away from bustling downtown…Terry came home with another gorgeous picture from his walk yesterday afternoon, I’ve just written a poem and it will be a perfect fit! Wonderful carving in the tree. Its great seeing things like this. Thank you so much for stopping by & commenting, it means a lot! What wonderful winter wishes…thank you so much for your beautiful words, it’s lovely to see them here! Kimberlee, I always enjoy reading your posts. In my mind’s eye, I am somehow magically transported by your words and feel as if I’m experiencing what you are experiencing. Loved the part of how you reminisced about you and your father traveling by taxi and searching for books together. Such poetry in your words! This warms my heart…I’m so thankful to have such a lovely platform for sharing memories and my corner of the world…reaching out to all of you here in the WordPress world has been a blessing…thank you (always!) for leaving such beautiful prose with your words, Mark! Hello, Aakansha! I hope you were able to get some sleep…it warms my heart to see your words…thank you for stopping by to enjoy a bit of magic despite the late hour! Such beautiful memories of your dear Dad and your shared love of books Kimberlee. Your new bookcase sounds wonderful. Wishing you many blessings for the year ahead. Thank you, Brigid! The box is getting full now, I have to make time to catch up on all the bits and pieces…I hope this note finds you well and looking forward to working in your beloved garden. That first paragraph is delicious – so full of sensual delights, I could taste it! I love the box of books and the memories it conjures, and the picture of warmth and cosiness you’ve built up so well. Beautiful. Thank you, Andrea…your beautiful words have brightened a rather rainy day! I love it! You’re a great champion for trees, Kimberlee!